Today’s post is from Tammy T. You know Tammy as a fellow book lover who posts regularly here on the LDB Blog. Enjoy! Losing the one place she thought she could call home, after a devastating act caused by her own hand, landing her back in the system until the age of 18. Finding herself emancipated, homeless, with no family and no place to go, she tries to find a job utilizing the only skill she has, her knowledge of flowers. A neighborhood flower shop owner, Renata, takes her under her wing. Renata not only helps nurture her love of flowers, but exposes her to a vast array of flowers and their potential while providing her with a place to stay and a sense of stability. While flourishing under the flower shop owner’s trust in her, she builds a huge clientele for the flower shop, becomes comfortable in her own skin, and even embraces Renata’s mother and her doting ways. As she carefully treads through her precarious new life, she meets someone, a young man that she has forgotten she once knew. Slowly their love blossoms and she must face making decisions that alter her new found life and love, at the same time forcing her to reconcile her past mistakes. 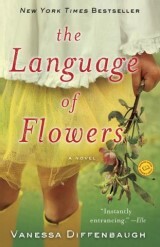 I give The Language of Flowers 4 out of 5 Sunshines!